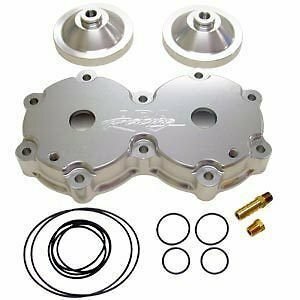 ADA Yamaha 760 Billet Head with 38cc Domes Performance Billet heads will increase power by uping the engine compression. Better bottom end take off and speed increase are benefits of changing compression. Kit includes head shell, domes, orings, and brass water fittings. This head uses the stock head bolts and is completely sealed by orings, no head gasket required. Exhaust mount bracket is sold separately and is required for any exhaust that mount to the head, like the stock exhaust. *Notes: . Must use BR8ES or BR9ES spark plugs, cannot use stock short reach plugs. Spark plugs not included. Other size domes available.